Doesn't hurt that I love strawberries, too. Strawberry shortcake is my favorite dessert in all the land. If you don't like it, there is something wrong with you. How could you not love fresh berries, fresh cream, all smothering a sweet biscuit? Cream whipped with barely any sugar. 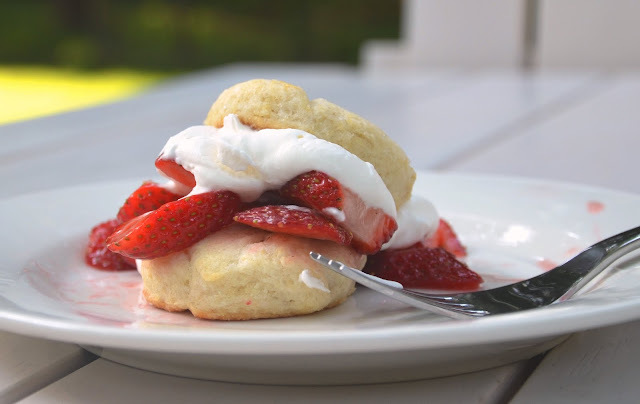 The shortcake is what makes or breaks Strawberry Shortcake. You should feel comforted by the fact that I know how to make the perfect shortcake. And that I'm going to share it with you so you can make it, too. A big advocate of portion control, I made mini-size shortcakes to encourage healthy portions. So what does it mean if it's so good that you have 3 healthy-sized portions? Instead, let's get down to business. Please make this this weekend. It's the perfect time. It will be exquisite. It will elicit marriage proposals. It will soothe crying children and calm squabbling siblings. Dessert brings people together, man. Quantities can vary depending on what kind of strawberry:cream:shortcake ratio you like. For the whipped cream, use 1 teaspoon vanilla extract and 2 tablespoons powdered sugar per cup of heavy whipping cream. Don't use any sugar at all, if you dare. That's the best. The strawberries are easy. Wash, hull, slice, then sprinkle with sugar to sweeten slightly and get the juices flowing. I still remember the principles of biology from 9th grade that cause cells to release water when in contact with a heavy concentration of anything, particularly salt or sugar (kudos, Mrs. Jeffress). For the best shortcake, I use a scone base, sometimes referred to as cream scones. Sift together the dry ingredients: the flour, baking powder, salt, and sugar. Make a well in the center and pour in the heavy cream. Fold everything together just to incorporate; do not overwork the dough. Keep in mind that the dough will 'mix' even more when rolling it out. Turn half the dough out onto a floured surface and flatten out until it's about an inch thick. You can use a rolling pin here for a more even result, but be weary of overworking the dough. 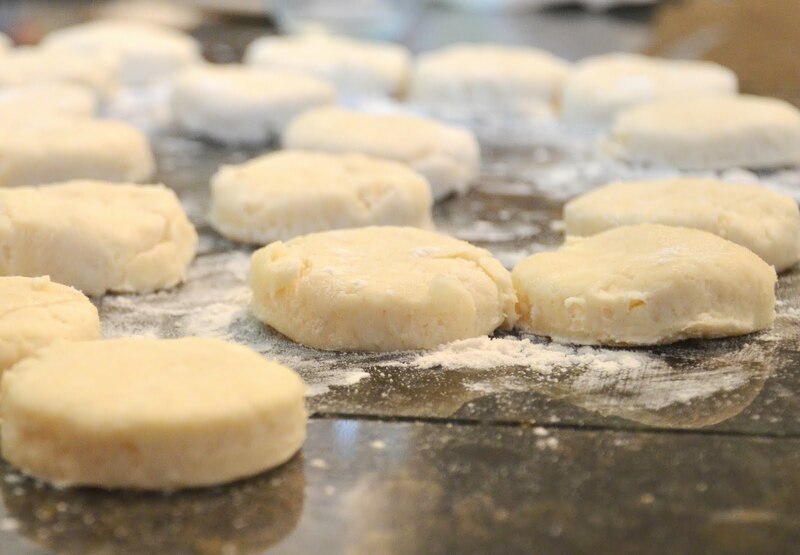 Use a biscuit cutter to cut circles. Or a glass. Or a stemless sparkling wine flute like I did. (It was the perfect size!) Cut into whatever shape you like, whatever size you like. Once you're left with scraps, slide them together and press together. I do this as opposed to rolling scraps into a ball and then flattening out again to avoid working the dough very much. Once you've done this twice, leave the scraps to become part of some funky extra piece you bake - after two reforms, its done being worked. 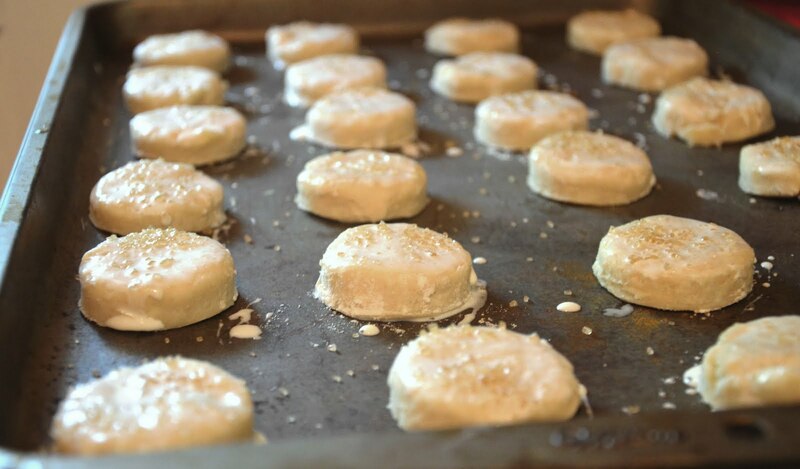 Place the scones on an ungreased cookie sheet and brush the tops with a little heavy cream, sprinkle with sanding or demera sugar. Bake for 8-10 minutes until the bottoms begin to brown. Watch carefully - the scones will not get terribly brown on top; the bottoms are the indicator of doneness in this case. Note: These will not keep very well - it's best to use same-day. Keep them uncovered and they'll dry out; in a ziploc and they'll get soggy. I tore a recipe out of a magazine that was very similar to this one, looks wonderful! The pictures you post are so great. What's your secret? How do you take such crisp photos? Thanks, Becky! They just got an upgrade because I got a new camera. Digital SLRs (I use a Nikon D7000) will give you more flexibility to adjust the shot - and they have a lot more megapixels than a point and shoot camera will.